“Forgiveness is not a straight line between two points,” says Dr. Ramona. “It is a significant part of the healing well process.” She explains that forgiveness is not a must do, but something we get to do. Making the decision to forgive is a personal choice and because of this, Dr. Ramona says that it’s no one’s place to tell a victim of domestic violence when he or she should forgive. 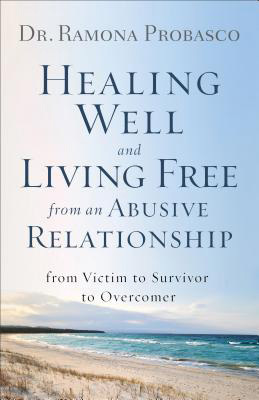 “I have been able to write about the steps to healing well from domestic violence because I have lived the steps, each painful one,” says Dr. Ramona. She actually stepped out of private practice for several years to go to counseling and work on her own healing well process. As she counsels women who have endured abuse, Dr. Ramona, who gave her heart to the Lord at 17, says she hears the same thing: How can I possibly forgive myself? She says it was easier to forgive her abuser than it was to forgive herself. “Forgiveness is a one-time decision, but it is also a process we walk through,” she says. Forgiveness is freeing: Holding on to unforgiveness only keeps you bound to the person who inflicted the pain. Forgiveness is loving yourself: Many victims of domestic violence do not have a healthy love for themselves or the experience of abuse has eroded it away. The freedom you receive from healing well is a direct result of learning to have a healthier love for yourself. When Dr. Ramona was ready, she started an online profile on eHarmony (at the encouragement of her brother who met his wife on eHarmony). She wrote on the bottom of her profile: If you’ve ever abused or cheated on your wife or girlfriend, please don’t contact me. Later Dr. Ramona spent time reading the story of Joseph in the Bible. “I wanted a true gentleman who loved God, loved himself and would love me as I deserved,” she says. “I was ready to meet my Joseph.” When she got a response from Tim, he wrote in response to the note on her profile: I have done neither nor will I ever. Dr. Ramona decided to go on a date with him. A year and a half later, Tim was in the kitchen and said to her in his worst Italian accent, Just call me Giuseppe! Giuseppe is Italian for Joseph! They were married two years later.